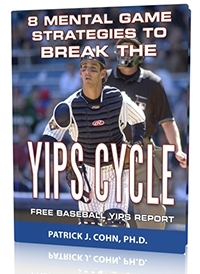 You are here: Home / Baseball Yips Articles / What Are The Throwing Yips? 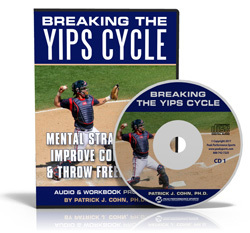 What Are The Throwing Yips? What are the throwing yips in baseball or softball? The throwing yips are another variety of the “yips.” I have worked with many players who had problems with the golf yips and the throwing yips. When you have the throwing yips, you simply can’t release the ball freely or send it to your target easily. Most ball players with the pitching or throwing yips lose control of their accuracy and can’t hit a target. Some players might pause or freeze during the throwing motion. Others can start the through swing and when they do they jerk their arm forward. The throwing yips can affect pitchers, catchers, and infielders alike. The yips mostly affect golfers, tennis players, and baseball players. The Mayo Clinic tried Botox injections on athletes to alleviate the symptoms of the yips, but this therapy did not cure the yips altogether. In my opinion after working with several athletes with the yips, the main problem is performance anxiety and fear of failure. Ball players who have a bad outing my also start to tinker with their mechanics and make matters worse. In many cases, they begin to worry about the outcome and how others view the problem. One case of the throwing yips I worked with was a high school pitcher that could not throw the ball back to the pitcher with accuracy. Note that throwing the ball back to the pitcher does not affect the outcome of the game. He would stand up and throw the ball back to the pitcher and could not hit the target, often throwing a blooper. What’s interesting is that he could throw well to second base with little to no problem when it counted! Is this a physical problem with his mechanics? Or is this a mental game problem? 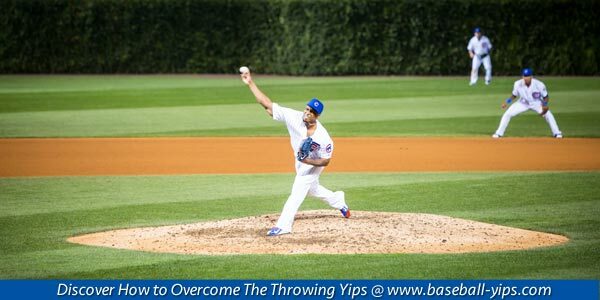 Related Article: Do You Have The Throwing Yips? My philosophy is that one bad outing can lead to the yips for some players. And when you begin to label yourself as having the throwing yips, you start to think you have an incurable disease. Some players try to be more perfect with their throw. And when you want to make the perfect throw, you try too hard and over control your motion. You have to simplify your throwing motion again, not make it more complex or perfect. You have to gain back the freedom of the throw—just like you are playing catch as a kid. As you gain confidence, your freedom and your accuracy begin to return. 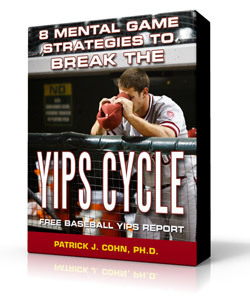 Beat The Throwing Yips With Mental Game Coaching!